Members Explore New Voluntary National Core Arts Standards at Annual Meeting Held at DAR on September 18. 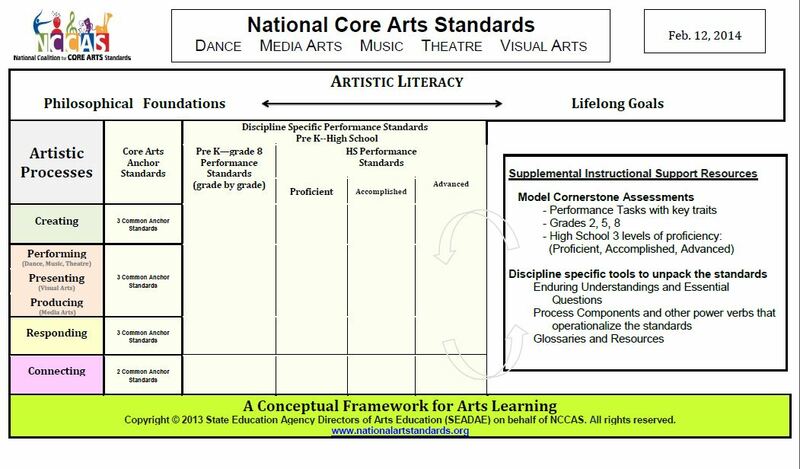 Members explored the new National Core Arts Standards with one of the primary architects of the project, Nancy Rubino, PhD, of the College Board. "The idea behind these standards is to prepare students for life after graduation," she said after sharing the inclusive process behind developing the voluntary standards written by 130 educators with input from 6,000 reviewers. The current set of arts standards emerge from the Artistic Processes of Creating; Performing/Presenting/Producing; Responding; and Connecting. Each artistic process branches into two or three anchor standards and are accompanied by instructional resources such as model assessments. In addition, the supporting resource include enduring understandings that state each art form's "big ideas" or important understandings--why they're worth studying--as well as essential questions which provoke inquiry. New media arts standards are also highlighted, since using new technologies is so integral to all teaching and learning today. The standards were launched by the National Coalition for Core Arts Standards which includes the following leadership organizations: American Alliance for Theatre and Education; Americans for the Arts; Arts Education Partnership; The College Board; Educational Theatre Association; National Art Education Association; National Association for Music Education; National Dance Education Organization; State Education Agency Directors of Arts Education and Young Audiences Arts for Learning. Members also heard from Nathan Diamond, the new Director of Arts at DC Public Schools, who emphasized the role of arts education as essential for developing critical thinking and communication skills. Members also heard from Matthew Reif, Director of Advanced and Enriched Instruction, at DCPS who invited cultural institutions offering arts education opportunities to DCPS students to provide input to the work of the 'City As Our Classroom' Experiential Learning Task Force. DC Collaborative board member Jeanette Spencer McCune of the Kennedy Center opened the meeting and thanked DAR Museum Director and Chief Curator Heidi Campbell-Shoaf and Education Curator Marilyn Sklar for hosting; DC Collaborative board member Linda Harper provided an update on the health of the organization; and board member Greg McGruder of National Geographic emceed the day's meeting. When: October 15, Wednesday from 6:00 to 9:00 p.m.
$1 from every draft beer and glass of wine ordered will be donated to the organization. Enjoy drinks for a great cause, select appetizers and raffled goodies with a beautiful view of the DC skyline. A suggested donation of $10 is requested at the door or online ahead of time. Arts for Every Student registration opened Monday, September 8. So far this year about 11,000 registrations have been made through the Arts for Every Student Program to the more than 500 events that our Membership offered in the Arts for Every Student Catalogue. This year is off to a wonderful start! their personal stories and prepare for college applications. Two members collaborated on an important project for students at Ballou High School resulting in two published student-authored books. "How to Grow Up Like Me: The Ballou Story Project" included memoirs, other creative writing pieces and photographs authored by 17 Ballou High School students. In preparation for their college essays, Kathy Crutcher founder of Shout Mouse Press, helped freshmen and seniors express their personal stories in a poignant way. Lana Wong, founder of Shoot Back, joined the project and provided instruction to students in the art of photography after she and Crutcher met at a DC Collaborative New Members' Meeting. The two also collaborated for "Trinitoga: Stories of Life in a Roughed-Up Tough-Love No-Good Hood," also published by Shout Mouse Press. The title, a combination of neighborhood names Trinidad and Saratoga, is the idea of the fifth and sixth grade authors. Crutcher and Wong were able to work with the students through Beacon House, a nonprofit located in Ward 5. "Trinatoga" is in novel-in-stories form, with short stories from various character perspectives intertwining as part of a greater work. "The fiction label allowed students greater freedom to tell their own stories or imagine ones that relate to their own experiences," Ms. Crutcher said. Learn more about this project at the Shout Mouse Press website! The DC Collaborative would like to welcome the African American Civil War Museum to the Membership! The African American Civil War Museum first opened its doors in January of 1999, seven years after the incorporation of the African American Civil War Memorial Freedom Foundation. Through the preservation their stories, the museum is able to share the experiences of the United States Colored Troops and African Americans during a pivotal time in American history. Education programs help younger generations explore why the North and South went to war, what happened afterwards and how African Americans helped in the fight for their freedom. Field trips for grades Pre-K to 12 are provided with pre- and post-tour preparatory materials. Visit the African American Civil War Memorial & Museum website for more information! Residency program for educators with the Smithsonian Libraries now accepting applicants! The Neville-Pribram Mid-Career Educators Awards allow mid-career educators to be in residence and utilize the Smithsonian Libraries distinctive collections, focusing on science, history, culture and arts. The awards are open to middle & high school teachers, college teachers, and museum educators working on curriculum development or publications in print or electronic form. In 2015, recipients will be awarded a short-term residency at the Warren M. Robbins Library at the National Museum of African Art. They will be offered an opportunity to conduct research in the arts of Africa and related fields of African culture and history. The Library offers excellent resources for developing curricula relating to Common Core, Core Arts Standards, and Advance Placement curricula. For more information, visit http://library.si.edu/travel-awards/neville-pribram-educators-awards. Applications should be submitted through the Smithsonian Online Academic Appointment system (SOLAA) by October 31, 2014. You may review the SOLAA User's Guide on their website to familiarize yourself with application procedures.